East Is East is a 1999 British comedy-drama film written by Ayub Khan-Din and directed by Damien O'Donnell. It is set in Salford, Lancashire, in 1971, in a mixed-ethnicity British household headed by Pakistani father George (Om Puri) and an English mother, Ella (Linda Bassett). East Is East is based on the play of the same name by Ayub Khan-Din, which opened at the Birmingham Repertory Theatre in October 1996, and Royal Court Theatre in November 1996. The title derives from the Rudyard Kipling poem The Ballad of East and West, of which the opening line reads: "Oh East is East, and West is West, and never the twain shall meet". Zaheed "George" Khan is a Pakistani Muslim who has lived in England since 1937. He has a wife in Pakistan. He and his second wife Ella, a British Roman Catholic woman of Irish descent, have been married for 25 years and have 7 children together: Nazir, Abdul, Tariq, Maneer, Saleem, Meenah, and Sajid. George and Ella run a popular fish and chips shop in the neighbourhood. While George is obsessed with the 1971 war between East and West Pakistan and arranging marriages for his children, the children themselves, who were born and brought up in Britain, increasingly see themselves as British and reject Pakistani customs of dress, food, religion, and living. This leads to a rise in tensions and conflicts within the family unit. Om Puri - Zaheed "George" Khan, the patriarch of the Khan family. Although he loves his family, he cares more for his own image and dignity than their happiness. He's also a woman beater who attacks his family violently when they disagree with him. Linda Bassett - Ella Khan, George's wife. An Irish-Catholic, she finds herself unable to stand up to George until he pushes her too far by abusing their children. Ian Aspinall - Nazir "Nigel" Khan, the oldest son. He is disowned by George after fleeing an arranged marriage for a homosexual relationship. Raji James - Abdul "Arthur" Khan, the second son. He seems to dislike conflict and does not rebel against George's authority until he abuses Ella. Jimi Mistry - Tariq "Tony" Khan, the third son. He is the most rebellious and even attempts to flee to Eccles when he learns of George's marriage plans for him. Emil Marwa - Maneer "Gandhi" Khan, the fourth son. He is the only one who obeys George's rules, and ironically the only one who George beats. He is devout and spends much time reading quietly in his room. Chris Bisson - Saleem "Picasso" Khan, the fifth son. He seems indifferent to George's authority but stands by his mother and siblings when George goes too far. On a comical note, he is studying Foundation Art, while George believes he is training to become an engineer. Archie Panjabi - Meenah Khan, the sixth child and the only daughter. She also has a rebellious streak and frequently teases Sajid. Jordan Routledge - Sajid "Spaz" Khan, the sixth son and youngest child. The pain he undergoes following his late circumcision is what prompts Ella to rethink her attitude towards George. He wears a parka at all times of day and night. Emma Rydal - Stella Moorhouse, Tariq's secret girlfriend. Their relationship becomes somewhat strained once she finds out George has planned to marry Tariq off. John Bardon - Mr. Moorhouse, Stella and Earnest's grandfather. He has old-fashioned ideas about race and ethnicity, supporting controversial political figures like Enoch Powell, and does not know of Stella's relationship with Tariq, although he is frequently irritated by Earnest's friendship with the Khans, who openly dislike him. Gary Damer - Earnest "Pongo" Moorhouse, Stella's younger brother. Like Stella, he is friends with the Khans, being Sajid's best friend and harbouring an unrequited crush on Meenah. It is implied that he is somewhat weird and often abused by his grandfather. Ruth Jones - Peggy, Stella's best friend. She appears jealous of Stella's relationship with Tariq and tries desperately to find a boyfriend, but her overweight figure repels boys. In the end, she is implied to have a romantic fling with Saleem. Madhav Sharma - Mr Shah, a devout Muslim desperately seeking Pakistani bridegrooms for his two comically unattractive daughters. Though he appears amiable on the outside, he is actually mean-spirited and rude, scoffing at Earnest Moorhouse for no reason and branding Ella as a disgrace solely for speaking back to his snobbish wife even when she insulted Ella first. On a comical note, his constant sweating is a sign of poor hygiene. Lesley Nicol - Auntie Annie, Ella's best friend. She frequently helps George and Ella at the chip shop and has an amiable relationship with George, although she advises Ella not to be too soft with him. US poster obscuring the film's British Pakistani character by featuring a blond woman. 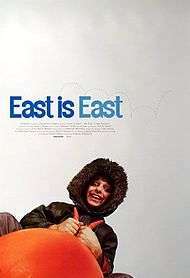 East Is East was remarkably successful for a low-budget comedy (£1.9 million budget), grossing some £10 million in the UK and more than $4.1 million in US cinemas, plus being a big hit across Europe. In addition, when the film was released on video and DVD, it made £12.3 million in UK rentals alone. Miramax, the film's US distributor, obscured the presence of South Asian characters in the marketing of the film: the poster features the face of a blonde woman, with the Asian characters appearing only in small windows. In France, the film was called Fish and Chips: la comédie qui croustille! ("Fish and Chips: the crunchy comedy!"). The film won the Alexander Korda Award for Best British Film at the BAFTA Awards, and was declared Best Comedy Film at the British Comedy Awards. The screenwriter, Ayub Khan-Din, won both a British Independent Film Award and a London Critics Circle Film Award for his screenplay. He was also nominated for two BAFTA Awards for Best Adapted Screenplay and the Carl Foreman Award for the Most Promising Newcomer, and for a European Film Award for Best Screenwriter. The director, Damien O'Donnell, won Best Debut at the UK Empire Awards, won the Evening Standard British Film Awards and Fantasporto for Best Film, won the OCIC Special Award at the Buenos Aires International Festival of Independent Cinema, won the Kingfisher Award at the Ljubljana International Film Festival, and received a number of nominations, among them a British Independent Film Awards nomination and a David di Donatello Awards nomination. A sequel, West Is West, premiered at film festive and London in the autumn of 2010, and was on general UK release from February 2011. A third film about the family is being planned. ↑ Gritten, David (2000-04-02). "A Culture Clash That's Universal". The Los Angeles Times. Retrieved 2010-11-18.